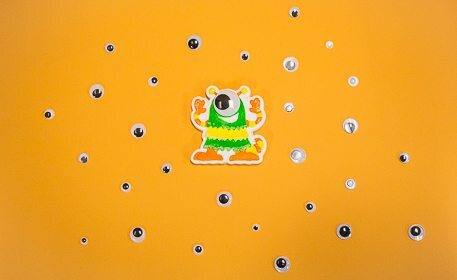 Use acrylic paint & glow in the dark glitter glue to detail a silly monster magnet for Halloween! 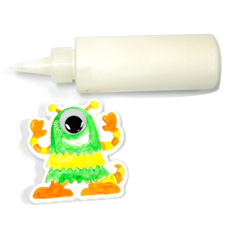 Add a large wiggly eye and watch your monster come to life! Glow in the Dark Glitter Glue 2.98 oz. Starting with one color, paint in all the areas of the monster that you want that color. We used yellow, but feel free to mix it up! Next, fill in with another color. We used orange. 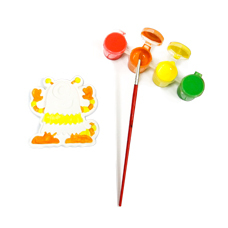 Paint the remaining areas in a third color. We used green. 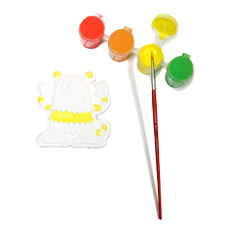 After the paint is dry, glue a 25mm wiggly eye on top of the plaster eye. 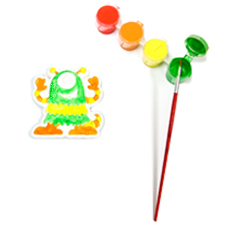 Embellish your monster magnet with glow in the dark glitter glue!